Max started playing ultimate his Senior year at Calvert Hall in Towson, MD where he started his ultimate career off strong, winning the Maryland High School State Championship. Max continued playing as a Freshman in college for the Maryland Space Bastards. He played exclusively Defense for his first 3 years in college. He also played for Town Hall stars from 14′-15′ during the club season. He was a part of the first Maryland team to make Nationals in program history in 2015. 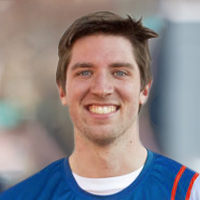 Max has since played two years with Medicine Men ultimate, helping propel the team to all-time highs. This will be his third year with the DC Breeze.